The truth is that millennials have excellent work ethic, a strong sense of charity, and things of that nature. But part of how we developed these attributes was by the instillation of a sense of inadequacy, which articles such as those documented here attempt to reinforce. I can't give blood *both* because of the sexuality clauses *and* because there's some microscopic chance I could've been exposed to mad cow in England in the 90s. And I'm not even a millennial. Yeah, I was born in Europe in the mid-80's, so nobody in America will take my blood anyway. They should combine blood drives with Girl Scout cookie sales. Donate blood, get a box of your choice free. I'd be anemic and full of sugar all the time. The calling thing is true. Red Cross calls Bride of Dracula at least once a day, sometimes more. I've been suspicious of blood drives ever since I heard this episode of Radiolab. Yeah, like we're gonna listen to someone named Dracula about blood. Nice try, vampire scum! It was not by his hand that he is once again given flesh. He was called here by humans, who wish to pay him tribute. "What is a man!? A pile of delicious blood!" Hey at least I don't call strangers and ask for their blood! Dracula - Less Evil than Telemarketers? Millennials refuse to buy into the scams of previous generations. Therefore Millennials are bad people. "Let the past die..." And if it refuses to die then have Millenials kill it. To be fair, Serendipity is one of the sappiest movies I've ever seen. I'm actually pretty curious just what the hell we did to handshakes. How can we stop them before they kill again? Offer them higher-paying, stable jobs so they can afford to buy frivolous crap like napkins again. "How hipster millennials are killing the Big Mac"
Is this implying all millennials are hipsters or that it's hipster millennials, not just any ol' millennials, that're killing the Big Mac? "Millennials turning away from cruises and casinos"
Truly strange behavior, what with all that disposable income. "Millennials have officially ruined brunch"
Some staid, middle-aged, upper middle-class white women. "I think I've lost my appetite, Daphne. These millennials have simply ruined my Eggs Benedict." "I agree, Karen. And these mimosas just aren't the same since they've allowed millennials to exist. Brunch is positively ruined." Well, we specifically didn't do anything to handshakes. But see, Millenials tend to give high-fives or fist-bumps, and it's been medically proven that those transmit fewer bacteria than handshakes, so we were just ahead of the curve. So is it just the Big Mac or are they also killing the Whopper? "Why are Millennials killing their bosses?" Milliennials are killing cereal because it's too much work, but we're blowing all our breakfast money on avocado toast, which takes more work than cereal. So which is it??? Both. Millenials exist in a quantum superposition of disapointing Baby Boomers in every way possible. I just discovered they have frozen, pre-cut avocado at my grocery store. Take it out, thaw, and toast. 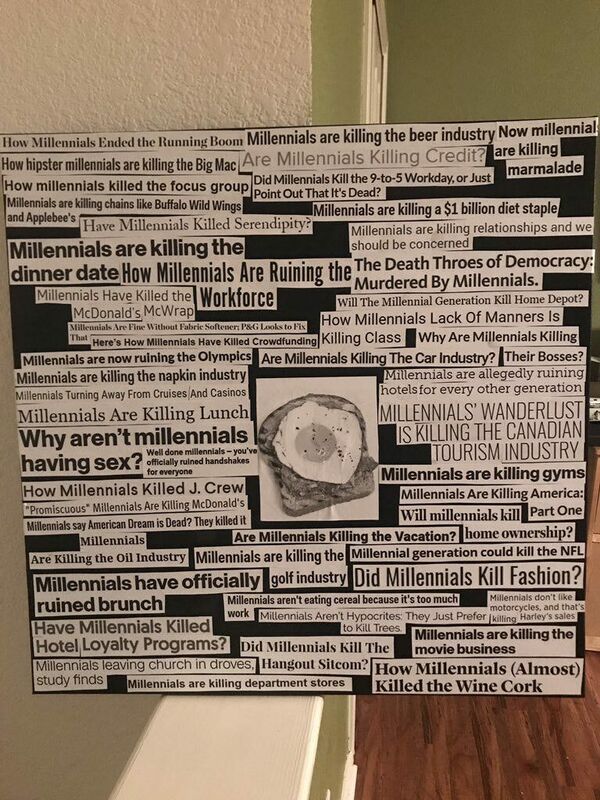 I am the Millennial Killer.